Review date: 22 January 2000. If you spend a lot of time staring at a screen, a good monitor is essential. And, for many people, "good" means, first and foremost, "big". No matter how clear and sharp your 15 inch or, horror, 14 inch monitor is, it's still going to give you eyestrain if you use higher resolutions. And, since dot pitches (see sidebar) much below 0.25mm are pretty much unknown, it's just flat-out impossible to display higher resolutions than 1024 by 768 sharply on a 15 inch screen. The advantage of the 19 inch monitor size is that it gives you about 80% of the screen real estate that you'd get from a 21 inch screen, but at about half the price. All other things being equal, 17 inch monitors give about 30% more screen area than 15 inchers, and cost about 1.5 times as much. 19s have about 25% more area than 17s, and cost twice as much as 17s. And above 21 inches, monitor prices really start to go nuts. So for most people a 19 is about as much monitor as their pocketbook can stand. Everybody wants more inches than everyone else. Just as hard disk manufacturers quote drive sizes in millions of bytes, not the powers-of-two that give you real megabytes and gigabytes, so to do monitor manufacturers inflate the quoted sizes of their monitors. They measure the diagonal size of the front of the picture tube. Since all standard monitors have a width to height (or "aspect") ratio of 4:3, this should make the measurements perfectly comparable. Unfortunately, the whole front of the tube is never actually visible, because of the plastic surround. How much of the tube gets eaten by the surround, and how far around the curve of the front edges the manufacturer chooses to measure, determine how much less than the quoted diagonal size you'll actually get to look at. Fortunately, every reputable manufacturer these days also quotes "viewable area" figures - they just often don't put them in type nearly as large as the "main" size measurement. 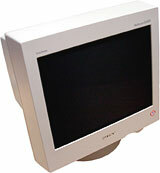 The Sony G400, a nominal 19 inch monitor, has a 456mm viewable area diagonal, or almost 18 inches. If you're after a 19 inch screen, there are a lot of options, covering a big price range. Sony's Multiscan CPD-G400 is one of the more expensive 19 inch screens, at $1699 (Australian dollars). The G400's most obvious feature is its very flat screen. In weaselly fashion, Sony describe the Trinitron tube in the G400 as "virtually flat". This is, actually, a rare example of helpful and informative marketing-speak. The screen of the G400 is, indeed, not quite perfectly flat, but for all practical intents and purposes it might as well be. 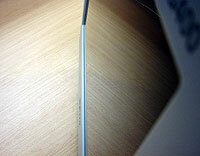 The screen is actually slightly cylindrically curved - flat vertically, but curved horizontally. The curvature, though, is exceedingly small. You'll see a little distortion of things reflected in the monitor if you move your head from side to side, but it's trivial. Flat screens are weird, when you're used to curved ones. Because you're accustomed to the edges of the screen curving away from you, and mentally compensate whenever looking at a monitor, a screen that's actually flat gives the impression of curving towards you at the edges. The older vertically flat models were bad enough; this even flatter one is even odder. There are two basic reasons why older and cheaper monitors have curved screens. One, a curved screen is stronger. And cathode ray tubes (CRTs, or just "tubes") need to be. Cathode ray tubes are the only popular survivor of vacuum tube technology, which means that inside your monitor's tube there's a whole lot of nothing in particular. The tube therefore has to endure atmospheric pressure pushing in on it from all sides (14.7 pounds per square inch, kids! ), with a big safety margin to make sure that a scratch or a thump won't result in a dramatic implosion. The closer to a sphere the monitor is, the stronger it'll be, and the closer to flat any side is, the better reinforced that side has to be. The atmospheric pressure problem is, by the way, why big monitors are so much heavier than small ones; there has to be a lot more glass in them than you'd expect by just scaling up the smaller screen, because the tube's surface area, and the pressure it has to endure, increases with the square of its size. The other reason why screens tend to curve is that the electron beams that "paint" the screen come from the back of the tube. It's easiest to focus the beams finely if the distance between the face and the back of the tube is the same at all points. This, for those of you who learned a lot about paper aeroplanes during geometry lessons, means that the front of the monitor has to be more or less a section out of a spherical surface. The flatter you make the face of the screen, the further away from the electron guns are the corners, compared with the middle, and the more focus control is needed. Apart from the distortion inherent in having your image projected on a section of a sphere, curved screens also give you a wide angle reflection of the room around you. This can make it hard to align the monitor so that some light source somewhere isn't reflected in the screen. The flatter a monitor becomes, the smaller its reflective "view" of the room, and the easier it is to keep irritating glowing things out of your view. With a really flat screen like the G400's, a light source has to be pretty much right behind your head in order to be visible. Some monitors have a flat face, but leave the back of the face curved, to make focussing easier. Flat on the outside, concave on the inside. This reduces reflections effectively enough, but does nothing much for image distortion, because the phosphor surface is still curved. If the G400 uses this dodge, it certainly doesn't do it noticeably. There's no image distortion anywhere on the screen, but it still manages excellent focus all the way to the edges. Once you rid yourself of the mental pollution caused by years of peering at imperfect CRTs, though, a truly flat screen is a lovely thing to have. The G400's other major feature is dual inputs. There's also a Macintosh connector adaptor, documented on a separate piece of paper so thin it could plausibly be hidden in a hollow coat button by British Intelligence. 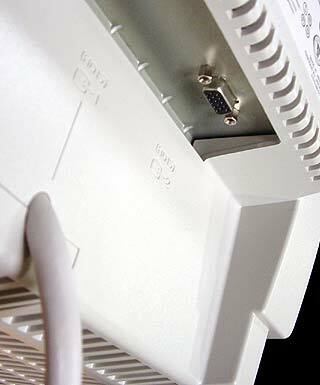 The adaptor converts the high-density PC-style 15 pin connector to the standard density Apple version. It also has a switch on it which, in the default position, lets the G400 pretend to be a 21 inch Mac monitor. This means older Macs will run it, by default, in 1152 by 870 mode (Macintosh monitor cables are wired to tell the Mac what resolutions they can support at the standard Apple 75Hz refresh rate). For use with G3 and later Macintoshes, you just flick the switch on the adaptor, which lets you use up to 1600 by 1200, if you like. With the adaptor and the second input, one G400 could work with both a PC and a Mac on the same desk. Neat. The G400 weighs in at a relatively svelte 26 kilograms. One non-muscular person can shift it from desk to desk without much likelihood of a Workers Compensation claim being filed. Once you get above 19 inch diagonals, monitors start to become a serious hernia risk. The G400's technical specifications are well up to scratch. It can do 800 by 600 at a frankly ludicrous 160Hz refresh rate, and stays above 100Hz for 1024 by 768 and 1280 by 1024. For 1600 by 1200, it can do 87Hz, which is still well above the flicker line. The G400 supports a maximum resolution of a rather imposing 1800 by 1440 pixels. It only has a 0.24mm aperture grille pitch, though, which with its 365 by 274mm viewable area means that its "recommended" resolution of 1280 by 1024 is actually a little higher than it can display at maximum sharpness, as explained in the "Dot Pitch Decoded" bar to the right. The Sony's aperture grille pitch is roughly equivalent to a 0.27 or 0.28mm conventional dot pitch. This means the G400 isn't actually a terribly high resolution screen, when "resolution" is used correctly, to mean "what can actually be clearly displayed", as opposed to "what can be shown at some, maybe acceptable, level of fuzziness". This is not to say that the G400 doesn't give a perfectly good display at 1280 by 1024 - it does. It's just that you can buy sharper monitors, and the difference will matter to you if you want to do fine high resolution work. If ultimate sharpness isn't important to you, though, running a monitor at a resolution much higher than its tube can clearly display can still be worthwhile. If you've got the hardware to play games in outrageous resolutions, you'll be able to do so just fine, and see that deathmatch opponent or MiG 29 a bit better in the distance. But if you wind up the resolution in business applications, you'll find that to maintain clarity you also have to increase the magnification and/or font size you're using, which sort of defeats the purpose. As a continuation of the seemingly endless series of Weird Controls On Monitors, Sony gives us the "DisplayMouse". Which is actually pretty good, although it's not at all mouse-ish. The DisplayMouse is a little joypad thing mounted next to the power button. It's mounted facing downwards, so it has left, right, fore and aft movement directions. By default it does brightness and contrast adjustment (for and aft for one, left and right for the other), but if you press the whole button upwards you get access to the main setup menus. These let you do all of the usual size and position and geometry setup. The DisplayMouse is a little fiddly to use, but I've wrestled with far, far worse. It does the job. You also get all of the proper geometry and colour control features - moiré adjust, rotation, pincushion, trapezoid, skew and so on. You can pick the colour temperature you want pretty much anywhere between 9300 and 5000 Kelvin, and you can twiddle the convergence, too, although it it seemed just about perfect to me without any changes. Colour temperature is a standard way to describe colours - the higher the "temperature", the bluer the light. The temperatures, measured in the Kelvin scale that has units the same size as Celsius degrees but which starts at absolute zero, are how hot an ideal black body would have to be to radiate light of a given wavelength. When you set white to a given temperature in your monitor setup, you determine the overall colour cast of everything it displays. Normal daylight is 5000K. There's also an "AUTO" feature that lets you tell the monitor to calibrate itself to the incoming video signal, centreing and sizing it appropriately. This didn't work worth a darn when I tried it, giving me an undersized, off-centre image, but maybe you'll be luckier. A more useful feature is ZOOM, which simply does both horizontal and vertical sizing at once. You also get an "Image Restoration" feature, which is supposed to restore its colour brilliance to its original factory settings even after years of use. And there's even a control lock option, to prevent anyone from fiddling with the settings. The Sony also has a good, old-fashioned, high-powered degauss coil. Far too many current monitors just go click and hum a bit when you tell them to degauss. The Sony goes GONK! and utterly scrambles its display for a moment. This is a good thing; it means the degauss coil has enough balls to deal with quite serious problems. Degaussing is the process of exposing the tube assembly to a rapidly oscillating and quite strong magnetic field, which fades away gradually to nothing. 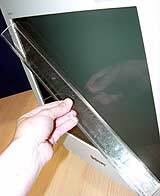 The idea of the exercise is to demagnetise any bits of the monitor that have been magnetically contaminated - like, for example, the aperture grille. Magnetic contamination causes "purity" problems, where sections of the screen get a colour cast because some magnetised component is pulling the electron beams off-line. The magnetic fields used by the monitor to put the electron beams where they're meant to be are not very much stronger than the earth's own magnetic field, so it doesn't take much to spoil things. You can see what I'm talking about by gingerly waving a magnet closer and closer to your monitor - you'll see the image start to distort and change colour. If you get the magnet too close to the monitor - which, for high-powered magnets, can be a fair distance away - you'll induce a purity problem which, I hasten to point out, your monitor's degauss coil may or may not be able to cure. So don't try it if you're nervous about turning a patch of screen purple until someone with an actual "degaussing wand" makes some magic passes to dispel the problem. Like all colour monitors worthy of the name, the Sony degausses itself automatically when turned on, and you can fire up the coil manually through the setup menu as well. So the Sony's a great screen, generally, even if it is a bit expensive, right? Well, there is one little problem. Every single Trinitron (or Diamondtron) monitor ever made has at least one and, for bigger screens like the G400, two or more, faint dark lines running horizontally across the screen. They're most visible on a plain white screen, but once you know they're there you can't miss them on any reasonably bright colour. Here's a close-up shot of the G400's screen, with Windows pointer for scale. See the damper wire shadow? Here's a close-up of my old ADI Microscan, for comparison. The different layout of the dots on the shadow mask ADI versus the lines on the aperture grille Sony is obvious. The lines are shadows cast by damper wires, and the damper wires are there because of the inherent design of the Trinitron tube. The aperture grille is made of oodles of tiny wires strung vertically, and they have to be stabilised against vibration, lest the monitor go all shimmery. It'd be easy for this to happen, without the wires, because monitor shadow devices operate to very fine tolerances. They're made of an "Invar" alloy (64% iron, 36% nickel), which has near-zero thermal expansion in the range of temperatures found inside a monitor. An expanding mask will shift the dots off the correctly coloured pixels, which is A Bad Thing; the odd colour waves you see on a monitor when you give it a sharp tap (the management assumes no responsibility for monitors broken by sharp tapping) are caused by the mask (or grille) vibrating and temporarily letting the electron beams illuminate the wrong phosphors. Aperture grille monitors shimmer more when you tap them than shadow mask monitors, because of the instability of the grille - which is why they need the damper wires. There are aperture grille monitors that don't have the shadow lines - LG Electronics' Flatron screens have a differently tensioned mask that needs no support wires. But if you buy a Sony, you get the stripes. Some people loathe damper wire shadows with all their heart, and would never consider buying a monitor that had them. Some people are a bit annoyed by them, but it fades. And some people never notice them at all - though, now that you've read this, you probably will! If you don't notice the shadows in the store but do notice them at home and decide they irk you, though, you'll be in trouble. Take a long hard look at any Trinitron or Diamondtron monitor (or television, for that matter) before you buy it, and see whether you find the shadows acceptable. You can get a 19 inch monitor for a lot less than the $AU1699 the Multiscan G400 costs, as long as you're willing to abandon the big names like Sony and NEC. A Samsung 19 inch, for instance, will set you back less than $AU1100, and a Videocom (a proud member of the South-East Asian Rebadge Brigade, but actually an OK product...) only $AU900 or so. This looks like a simple enough choice. When deciding between name brand and no-name screens, a lot of people go for name brand, on the grounds that they're going to get a better monitor. Sure, maybe a monitor that costs twice as much won't be twice as good, but you're still definitely going to get a better screen, right? The control system and styling and build quality and factory warranty support might well be better for a name brand monitor. But the biggest component of the monitor is the Cathode Ray Tube (CRT, or just "tube"), and most computer CRTs are made by exactly four companies. Conventional triad dot tubes mainly come from Hitachi or NEC, and aperture grille tubes are pretty much a Sony and Mitsubishi duopoly - Mitsubishi licenses the technology from Sony, and calls it Diamondtron instead of Trinitron. Most of the little monitor manufacturers buy their tubes from the big names. This doesn't mean that a cheapo monitor which happens to have an NEC CRT in it will give as good an image as a current model NEC. The latest and greatest CRTs show up in the monitors made by the CRT manufacturer first, and, all other things being equal, the cheaper the monitor, the older the model of CRT it'll have in it. Then again, there's a range of tube models even among CRTs of a particular vintage and size. The big manufacturers make different types for different markets, because there's no point selling ultra-high-resolution screens to business users who just want to word process, and also for the prosaic reason that when you make a range of monitors it just doesn't pay to make entry-level models that give image quality too close to that of your "pro" screens. Furthermore, it's quite possible for a good tube to be let down by lousy support electronics. Something has to tell the electron beams where to go, and if it doesn't do that very well, or the monitor is poorly set up in the factory, or the power supply isn't up to scratch, the image will look worse than it would on a better made name brand monitor with the exact same tube. But none of this means that a cheap monitor has to be any worse than an expensive one of the same size, and it may represent startlingly better value for money. Well made, reliable, cheap monitors like Samsungs and Videocoms have a lot going for them. The cheapo Videocom has a 0.25mm dot pitch; the Samsung's 0.26. This makes them actually a bit sharper, generally, than the Sony, though they still can't maintain full clarity above 1024 by 768. Both of the cheaper monitors can also manage a perfectly respectable 75Hz refresh rate at 1600 by 1200, and an even more stable 85Hz in 1280 by 1024. About 72Hz is the point below which most people start to notice flicker. It's pretty much impossible, at least as far as I can see, to pick the difference between 80Hz and much higher refresh rates. You don't get a Macintosh cable adaptor with cheap monitors, but there's nothing magical about such adaptors. You can buy them separately and use them with any monitor, as long as the adapter doesn't report the monitor as being able to do resolutions which it actually can't. Some adapters have switches built in that let you set them to report anything you want to the Mac. It's hard to evaluate monitors if you don't have them set up side-by-side. Monitors in computer stores are also commonly set to less than optimum resolutions and/or refresh rates, and don't necessarily even have their brightness and contrast properly set for the ambient light. If you're not already quite sure that a particular monitor is definitely the one for you, go somewhere that'll let you see the ones you're interested in next to each other. The G400 is a nice screen. I set it up as my work monitor and stared at it for some days without irritation, although I must say I'm no fan of damper wire shadows. But, for the money, this isn't a monitor I'd buy. Given the choice, I'd settle for the Samsung or Videocom options. $AU600 to $AU800 saved is significant. I'd be happy to walk out of the computer store with a less funky monitor, plus 128Mb more RAM and a 20 gigabyte hard drive. If you're willing to pay for the latest and greatest, though, a Multiscan G400 will be a good screen for years to come. All colour CRT monitors - and televisions - use three electron beams, one for each of the primary colours red, green and blue. The electron beams differ only in where they originate at the back of the tube; they don't, inherently, each have a "colour". But the phosphor on the inside of the front of the monitor does. Red, green and blue phosphor dots are arranged in a regular, repeating pattern, so any given colour has neighbours of the other two colours and thus, by varying the amount of electron energy thrown at each dot, any desired colour can be displayed by each set of three dots. The maximum resolution a monitor can display is, thus, determined by how closely packed its phosphor dots are. It's possible to send a monitor a signal that's of a higher resolution than its dots are physically capable of clearly displaying; the result is a fuzzy image. To make sure only the right dots are illuminated, monitors has a shadow mask, or in the case of Sony Trinitron and Mitsubishi Diamondtron screens, an aperture grille. The mask or grille sits a little way back from the screen surface, so that the electron beams hitting it from slightly different angles (because, remember, they originate from different points at the back of the CRT) cast spots or stripes of light at different points on the phosphor. Each gap in the mask or grille is positioned, remarkably accurately, so that the electrons that pass through it from each of the three beams hit a phosphor dot of the right colour. If you imagine yourself squished into the electron gun and peering from its point of view towards the front of the monitor, the only bits of phosphor you could see would be the ones of the right colour for the beam you've chosen. Aperture grille monitors have a quite different phosphor pattern from shadow mask ones, which makes it hard to compare their resolution capabilities with those of shadow mask monitors. A shadow mask monitor's dot pitch, or phosphor pitch, along with its size, determines how high a resolution it can clearly show, regardless of what resolutions its electronics will accept. Dot pitch is the distance between any given dot and the nearest dot of the same colour - red, green or blue. 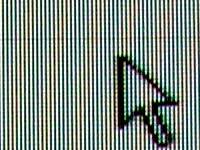 The smaller the dot pitch, the more pixels per inch the monitor can display without running the pixels together. This is the dot layout of a standard shadow mask monitor. Each displayed pixel must cover at least one red, one green and one blue dot - a "triad" - in order to be displayed correctly. Since the dots on most monitors are arranged in equilateral triangles, any given triad is 0.866 of the dot pitch away from any other one, and so the theoretical maximum number of pixels per inch of a .28mm dot pitch monitor of this type is about 105. The dot pitch doesn't, however, tell you the horizontal and vertical distances between triads, if they're not equilateral. The horizontal and vertical triad pitch of the monitor varies depending on the dot layout used; most shadow mask tubes have equilateral triads, but monitors that use Hitachi's Enhanced Dot Pitch (EDP) layout have an isosceles triangle layout instead. This gives them a coarser vertical pitch. Needless to say, Hitachi quote the horizontal dot pitch when describing these monitors. The computer you connect a monitor to has absolutely no idea how sharp the picture tube is; it just sends the monitor an analogue waveform that the monitor turns into an image. The pixels of that image will map onto the dot triads such that they split them to some extent, because the triangular pattern of phosphor dots cannot be perfectly mapped to a square grid of pixels, even if there happen to be exactly as many pixels as triads. But if the pixels are small enough that too many of them are fighting over the available triads, the actual colour of the triads will be the average of whatever pixels impinge on that area, with weighting according to the area of each pixel that occupies each triad. If all of the competing pixels are the same colour then nothing changes, but the more different the pixel colours are, the more obviously fuzzy that inter-pixel boundary will look. Because of this overlap issue, you can only use about 75% of the apparent maximum resolution before the image gets fuzzy. So the abovementioned .28mm dot pitch monitor can actually display about 79 pixels per inch. The canonical pixels-per-inch figure for monitors is 72, corresponding to a .31mm dot pitch. If you can only display 72 sharp pixels per inch, a "17 inch" monitor with a 12.5 by 9.25 inch viewable area is good for only 900 by 666 really sharp pixels. 800 by 600 will therefore look great, 1024 by 768 will probably be bearably clear and fine detail will be fuzzy if you use higher resolutions. Sony Trinitron monitors and some others use an aperture grille (lots of vertical wires) instead of the usual shadow mask, and so their pitch figures are not directly comparable with those for regular picture tubes. While aperture grille tubes are brighter than conventional ones, their stripe-shaped "dots" mean they are of necessity also less sharp. A good current-model shadow mask tube can give spookily sharp black-on-white text, for instance, and looked at side by side will be noticeably sharper than an aperture grille monitor. This is a simple function of geometry; a plain 0.26mm dot pitch tube has 0.22mm horizontal and 0.14mm vertical dot spacing, while a high quality 0.22mm stripe pitch aperture grille monitor will manage the same 0.22mm horizontal spacing, but only 0.44mm vertically. Add about 15% to an aperture grille "stripe pitch" to get the equivalent dot pitch. There's a good, though slightly outdated, article on the different kinds of shadow apparatus and how to measure relative resolutions on ZDNet here.